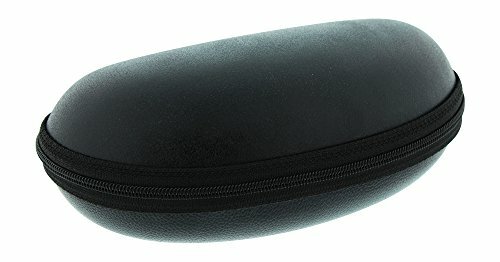 Protect your expensive eyewear with this double sized semi-hard faux suede glasses case. This extra-large, oversized case is roomy enough to accomodate two pairs of your most fashionable sunglasses and eyeglasses. The semi-hard exterior has a super soft faux suede finish and a wrap-around zipper that closes easily and securely, keeping your frames safely inside. The interior is lined on both sides with a plush cloth pocket to protect two pairs of glasses from scratches and damage. Exterior dimensions: 6.5 inches long, 3.75 inches high, and 2.25 inches deep. Interior dimensions: 5.5 inches long, 2.25 inches high, and 2 inches deep. This sporty looking case will make the perfect accessory for your two favorite pairs of reading glasses, eyeglasses, or sunglasses.